At the time of writing we’re still awaiting an official statement on the output, but we believe that the new “observed speed” (downstream and upstream) figures relate to Ofcom’s new 2018 Voluntary Code of Practice (CoP) for broadband ISP speeds (details), which is due to be introduced from March 2019. We know that BT Wholesale planned to make related changes on 17th November and that’s when these were spotted. The checker normally only returns rough estimates based on the operator’s understanding of the line itself, while the new “observed speed” output appears to display a “sync” speed for copper (ADSL2+) and hybrid fibre (FTTC / G.fast) broadband lines (i.e. the max possible connection speed that could be delivered to your home router / modem). A sync speed may thus also reflect any weaknesses in your home wiring, which can slow down the connection. NOTE: Just to clarify. The “sync” speed being reported is only looking at the wholesale side of a line (i.e. it will report the best “sync” for your line, which might not be the same as your current package). 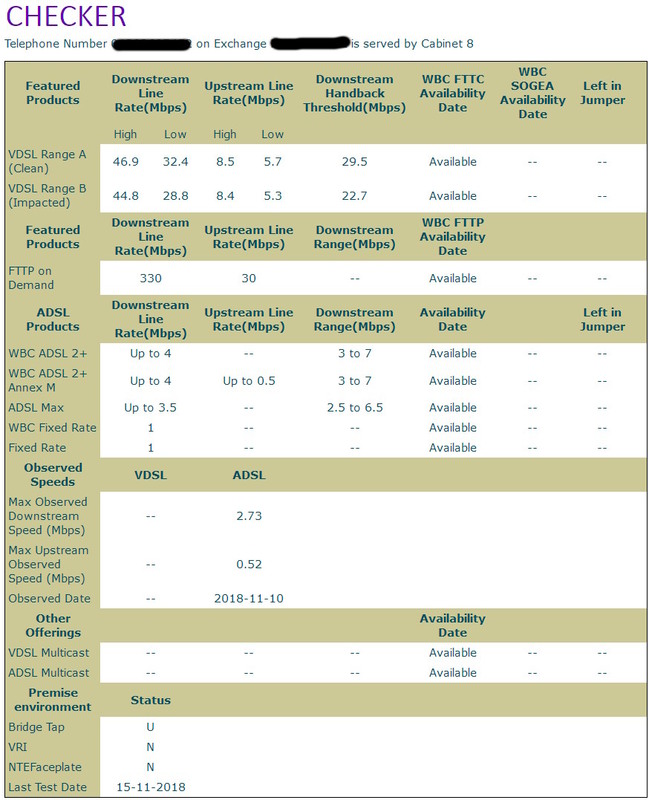 Admittedly this may be intended to help ISPs, but it’s also very useful for consumers who want to compare the standard line estimates against actual reported performance. One caveat here is that BT Wholesale can only report a sync speed for whatever services have been live on the line before, thus if you can get VDSL2 (FTTC) but have only ever used ADSL2+ then the only “observed” result you’ll see is for ADSL2+ (see below). Mind you’re were a little wary of the fact that this will also enable anybody to find out whether a specific number has an ADSL or FTTC service attached, which could potentially be abused by scammers (nuisance calls). Openreach has confirmed that this relates to Ofcom’s planned Voluntary Code of Practice on broadband (BB) speed changes. In short Ofcom want ISPs to use existing BB speed information to support their Point of Sale discussions with customers where it exists rather than predicted speeds to underpin greater accuracy. Ofcom also plan to publish a further Annex to the Code in February 2019, which will set out how observed speeds should be used. To help ISPs meet the requirements of the new code Openreach are sharing observed speeds in the form of actual sync speeds in Mbps or Max attainable line rates in Mbps on capped lines, for existing or recent BB services on a line through their enhanced Managed Line Characteristics Service (MLC) which is provided for free to established providers. We further understand that Ofcom are running a workshop in January 2019 with the aim of agreeing use of observed speeds, and the relationship with the minimum guaranteed speed. They also expect there to be 1 year implementation window from publication of the Annex. However there is still some debate across the industry about how GDPR affects the use of observed speeds in some scenarios. I have a screenshot from the BT wholesale speed test showing my rubbish FTTC connection which speed tested 30Mbps down at the time as 339.05Mbps instead… great if it was true. Interesting. They obviously don’t backdate or keep older records as my old adsl doesn’t exist in observed speeds. Yes some extra data points have also been added, although they’re not as visually noticeable. As for the new speeds, they’ve only recently started tracking these as it took awhile to develop the necessary system, thus you shouldn’t expect to see any data for historic connections. Do you know what the last testdate covers? (surprisingly in the last 72hrs in my case.) Copper and fibre? Pity it’s not correct. Apparently they observed 80Mbit on my line on the day it was installed. It’s not true at all. The maximum the line has ever done was 75 and even my ISP has confirmed that. I’d be surprised if it was wrong (as in never right) as its doubtless an autofill from their data checks. It might have been brief and if its not holding that it ought to drop the the correct typical speed. Well I just find it odd that it’s 80 down and 20 up and precisely these amounts. Which is about maximum for VDSL and i’m 285m away from the cabinet at least following the footpath around to it. So for me to get 100% of available upload and download just seems a bit unrealistic. It will be interesting to see if it changes, but i’m coming up to a year on this ISP now and it’s still showing that it was observed on day 1. My parents line when it is working properly gets 62 Mbps and not a jot more. Unfortunately its a notoriously unreliable line which has a noisy line fault about twice a year and has done for about 3 years. When that happens the broadband speed also drops to aound 30 Mb (depending on how bad the noise is) and even when the noisy voice side is fixed will never recover to its best. Typically it will only fix itself after a week or 2 to the tune of about 50 Mb but not increase after that without a DLM reset. BT Openreach engineers have been reasonably good about things, though they were not in the beginning. Now when they attend as they line has a notorious and documented problem my parents only have to tell/show them its affected the broadband speed also and ask for a DLM reset and 9/10 times there is no argument and they ring through if needed (depends on class of engineer that attends) to get it done. In the beginning they would pull the ‘im only here for the voice fault’ or ‘the broadband will fix itself’ line, but after 3 years they know that will not wash anymore so just fix it all in a single visit. After the DLM reset the line will as @TheMatt and @bob mention default back it is new/out of the box (or should that be cabinet) default of 80 Mb. After a week or so that will reduce and settle at the 62 Mb which is their regular speed….. Until the noise fault comes back and the merry game starts again. Looking at the checker for their number it has a result recorded back in October also of 80Mb down and 20Mb up just like @TheMatts, which is no shock as that is exactly when they last had Openreach out to fix their noisy line, complete with DLM reset. Their actually speed right now as measured through speedtest.btwholesale.com is what it always is when working properly and that is 62 Mb. LONG story short…. I hope this new figure is not being used to calculate speeds as per Ofcom rules for 2019 which the news item mentions, because NOPE it is not accurate or even correct in any way. UNLESS and i doubt this, it is going to updated regularly. It certainly is not being updated once or more per month because the recorded October speed for my parents is over 1 month ago (IE before the 21 October). Reporting the port speed would be pointless. It may be the case that this data is being rolled out slowly as its not required to be accurate yet. fast: The packages are up to 76 now and have been for some time. As said it is not accurate or even correct in any way. Certainly not disinformation from myself. Tell BT to sort it out if it is wrong. The sections come from different sources and as always should be treated as a guide. However it appears reliable for my line and I get the full table for the products available including observed VDSL figures. However it does not appear to be dynamic and is itself coming from derived data. My neighbour who’s house has always been via Telewest/VM only gets the basic product elements related to the address. The BT Wholesale speed test will still need to be used to identify any improvements made. It is always over optimistic but good enough to show a change in either direction. ISP service or internet speed tests will always of course be lower. However the more information on the broadband availability checker the better and good for those considering moving from one Openreach area to another. The issue is will Openreach proactively respond in any way if the observed speeds drop significantly below the estimated speed for the address as this clearly shows that the data is readily available. i.e a theoretical Superfast (> 30 Mbps) line delivering 15Mbps. MALR: Max Achievable Line Rate. Funny how the ‘observed rate’ is higher than the max achievable rate..
Wonder if MLAR is only shown on the checker that requires a login, or if it’s shown on all. Tried my number on the site just to see what it would say. Apparently I’m not a BT line. Only seems to appear on 21CN connections. Yes that would make sense as the 20CN platform will have been almost entirely replaced by 21CN come March 2019, with only a very few thousand premises left to solve. No sense building a new system for something you’re in the process of scrapping. Just wondering how often observed speed will be updated? No1 knows yet afaik. But Ofcom will have to have a agree check frequency so they can match it against the promised contract speed range. From my experience they use the observed speed to alter (lower) the handback threshold whenever it is in danger of being triggered, so they will change it at least as frequently as they need to do this. Curious. No additional info whatsoever for my EO line in SE16. I’m on a long rural EO (Exchange-Only) line, on a 21C (Market A) exchange (with only ADSL / ADSL 2+ showing as available) in Wales (Rhydlewis exchange), and the checker shows no “Observed Speeds” section for me. I’m on ADSL max and the speed shown it fairly realistic, far better than the very pessimistic estimate. The real work of fiction is the ADSL 2+, which had been a month away since since last August 2017, then it became fixed on 29/11/18, until today when its gone back to a month away.